This page contains affiliate links. Read Full Disclosure I hope you enjoy these FREE activities! They are geared for children about 18 months - 4 years old. Be sure to follow me on INSTAGRAM, FACEBOOK and PINTEREST to see when I post new activities, printables and FREEBIES! 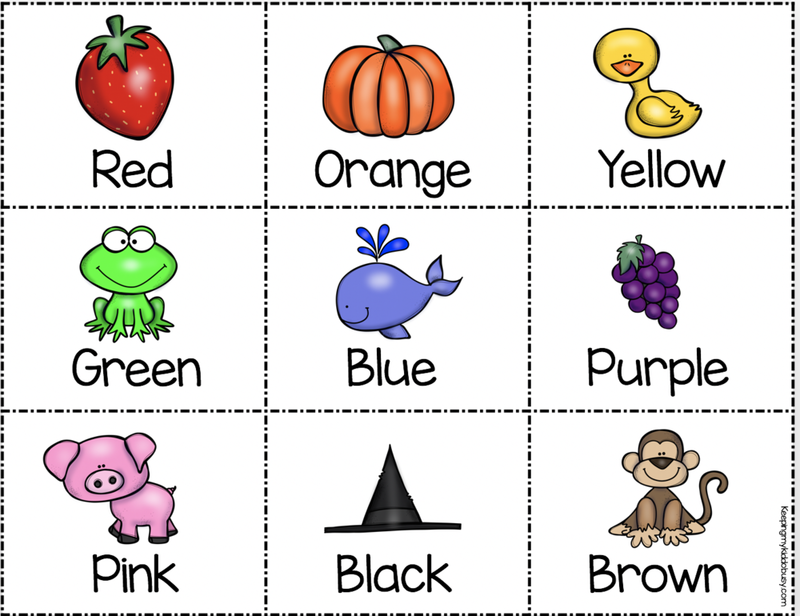 These adorable worksheets are a fun way to explore and learn about colors!When I am teaching my little ones about colors, we do one color a week. 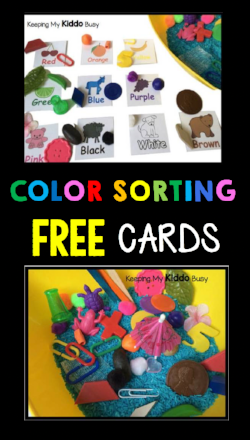 We collect things around the house that are a specific color and then color the worksheet. We then practice spelling the color word. I keep all the little things we collect in a tub and then we can practice sorting too. 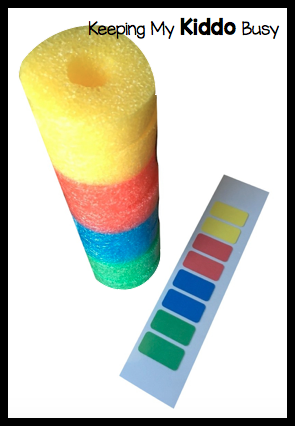 A fun and easy way to explore the colors around us! Sensory bins are one of my favorite ways to teach new skills. Children are naturally engaged with these hands-on bins and sorting is so much fun! Print these cards, cut apart and laminate (optional) and added your shapes to a bin or beans or rice. Children can explore each shape and discuss sides, corners, edges, etc. 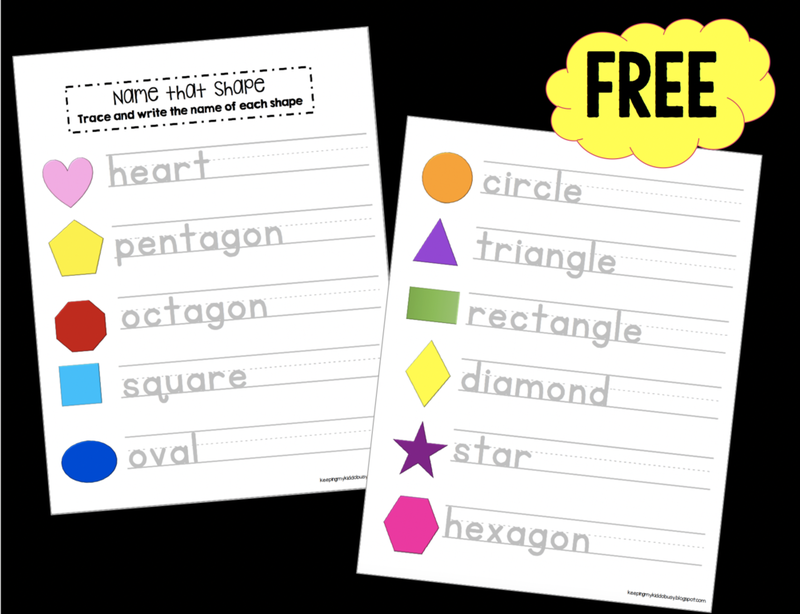 These shape posters are perfect to laminate and hang up, or you can use them as spelling/handwriting practice. These cards are perfect for teaching your child about pattern blocks! Every child absolutely loves playing with pattern blocks - building animals, shapes, towers, patterns and more. This is my absolute favorite activity for 18 month - 2.5 year old children. In this Montessori inspired activity, children match the mini animals to the animals on the cards. All three of my children have loved this game, and it is just the cutest to watch them engage with this activity.Print these mats (laminate and cut apart if you choose) and your children are ready to learn all of these animals. These little animals have adorable details and are much higher quality than many other animals I found in toy stores. Plus, the kit comes with FIVE complete sets, so it is perfect for classrooms, as party favors/gifts and in case you lose an animal or two. The Farm Animals are so fun, and children are so excited to see so many animals they recognize. Last are the Ocean Animals! My girls all love using this fruit busy bag! Children can match the fruit to the picture/word cardsFollow the fruit patternsand even fill up their baskets with fruit to match the pattern cards! This complete kit is FREE and it addresses so many important skills such as matching, patterns, following directions, problem solving, beginning reading skills and so much more! This is a super easy and fun activity for younger toddlers. 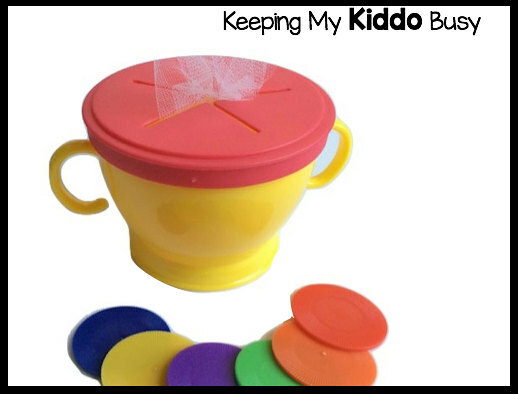 This simple little snack cup serves so many purposes.Not only do we love using the cup for snacks like Cheerios, goldfish, etc. but it also serves a fun little busy bag. I cut up ribbon, tulle or use large color chips and my 18 month old loves to pull the ribbon and tulle out (think tissue box or wipes container!) she will do this over and over again. To then switch it up, she loves to place the chips into the container. Fill, dump, repeat. 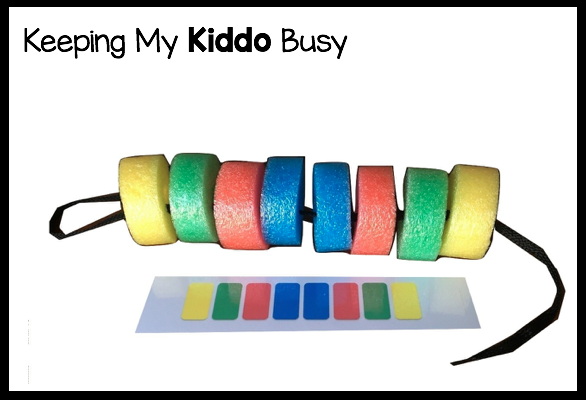 It works on hand-eye coordination, fine motor skills, etc. This is a super easy busy bag to put together. My 18 month old will sit and play with these jumbo nuts and bolts for a good 20 minutes. We work on matching the colors, talking about the shapes and learning how to hold with one hand and twist with the other.I cut up pieces of foam and make slits in them. This adds an extra challenge for her that she enjoys! There are a few brands of these nuts and bolts out there, but these nuts and bolts are definitely our favorite. They twist together nicely and are perfect for little hands to work with. I also like that the nuts and bolts that are supposed to go together are the same color. 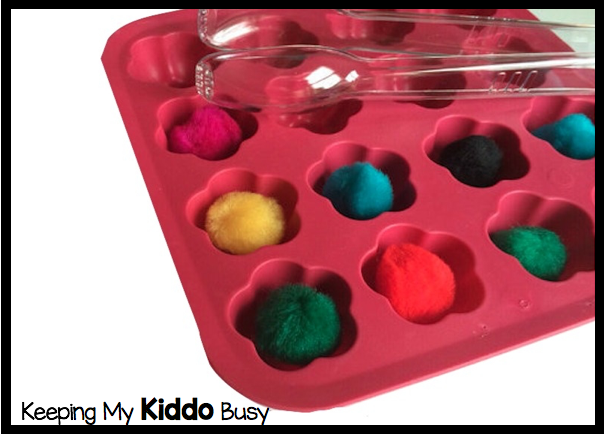 This is another easy busy bag to put together, and anything with tongs is always a hit with my little ones!I put all the mini color poms in a bowl, give my toddler plastic tongs and she transfers each pom to the tray. This is a fun activity to practice fine motor skills and hand/eye coordination. For this busy bag, simply take a dive wand (stock up in the summer months!) and hot glue ribbon for children to weave in and out. It is trickier than it looks for them! I made pattern cards for my children that they enjoy following. Use a shoestring or they can turn the cards and stack tall towers. Looking for a busy bag that you can make for super cheap? 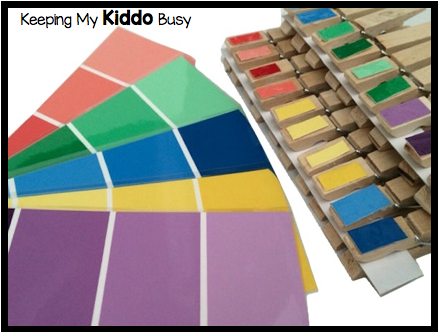 I use old paint color cards and clothespins to make a fun color matching activity! This activity is adorable to watch because sometimes the colors are super close and hard for children to distinguish. It will surely keep them busy for a good 20 minutes! Who knew there could be so many shades of purple?! This is another inexpensive and easy color matching busy bag. All you need are pony beads and pipe cleaners! I switch it up by having them use one hand or two hands to lace the beads. Then we also practice counting with the beads... "Please put 5 red beads on, 4 orange, 3 yellow, 2 green and 1 blue!" The pony beads we use are small and could be a choking hazard, so I always sit with them for this activity to supervise.